The very nice people at Ross invited the OGHT to join them in their 150th anniversary celebrations to be held over Labour Weekend 2015. OGHT immediately turned this opportunity into a field trip and ultimately eleven Trust members headed over to the West Coast. Bonnie and Susie (plus pooch) did their own thing in their motor-home, Jeanette and Bob McKay travelled in their own vehicle in the OGHT convoy and seven members gossiped all the way to Ross and back in a rental van. Rex Johnson was a late ring-in to replace van-driver Martin who had introduced some last-minute drama into the trip plans by requiring some quiet time in hospital. So Rex drove the van with passengers Bruce and Lesley McMillan, Mike Floate, Jennie Stephens, Fern Gould and Sue Humphries. The Friday drive to the West Coast was very sedate with a lunch stop at Makarora, a photo stop at Fantail Falls and an explore of the DOC information centre at Haast, all with only a few spots of rain when up in the mountains. Our destination that night was the Top 10 Camping Ground just outside Franz Josef where we had booked cabins. That evening we drove into Franz Josef township for our evening meal and a chance catch-up with Bonnie and Susie. 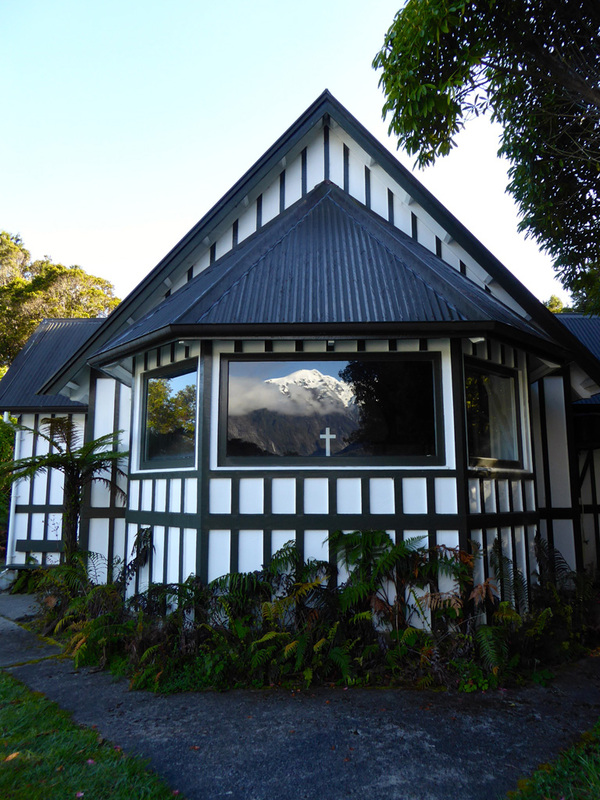 Saturday morning we went back into Franz Josef to fuel up and explore a historic church overlooking the river and mountains. About 15km north of Franz Josef turned off to explore Okarito village and catch a glimpse of a white heron in the nearby swamplands. Then it was on to Ross where we sorted out accommodation for everyone before joining the locals. They were gathering at a large marquee on the rugby field for the official program which started that afternoon. 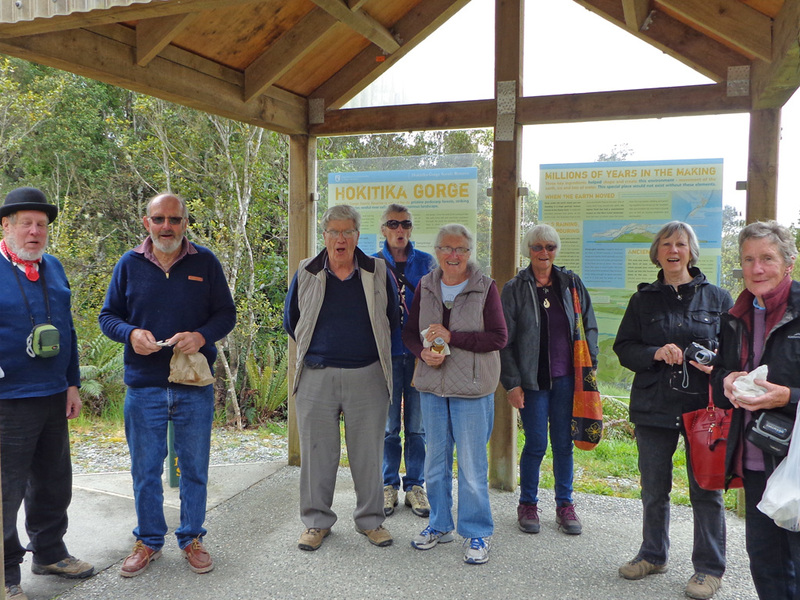 Their focus was on opening the Ross to Hokitika section of the Wilderness Cycle Trail. A series of short speeches from the podium established how proud the community was about this achievement and some glowing comparisons were made to the Otago Central Cycle Trail. 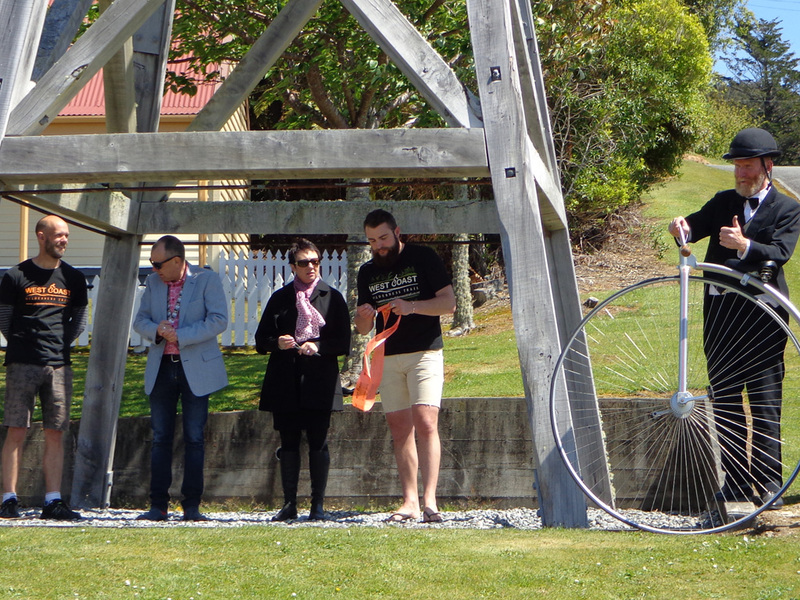 Most of the speakers were clad in cycling gear and had ridden that morning along the trail from Hokitika. After the speeches there was a formal ‘cutting of the ribbon’ ceremony beneath an old goldmine ‘poppet head’ near the information centre – the site being the Ross terminus of the trail. The kids then had some fun with tug-of-war’s, sack and skipping races plus face painting while adults patronised BBQ, drinks or afternoon tea stalls. Around this time Mike Floate got hold of the mic attached to the PA system and thanked the organising committee for putting on such a great show and on behalf of the Otago Goldfields Heritage Trust, thanked the organisers for our invitation. The marquee also had a display of future plans for the Wilderness Cycle Trail south as far as Fox Glacier which was great to see and discuss. Nearby was a Heritage New Zealand table where a discussion was held about HNZ’s intentions to visit selected old Cromwell-area shearing sheds to plan displays of heritage movies for the local community. Ross had turned on stunning weather for the day so it was a pleasure to wander about the town, admire a ‘steam-punk’ fence of metal memorabilia, visit the information centre museum and learn about ‘The Honorable Roddy’, a 100 ounce gold nugget the size of a fist which had been discovered in the Ross gold workings. Evening entertainment included a fireworks display on the banks of a lake remaining from Ross’s old gold workings. 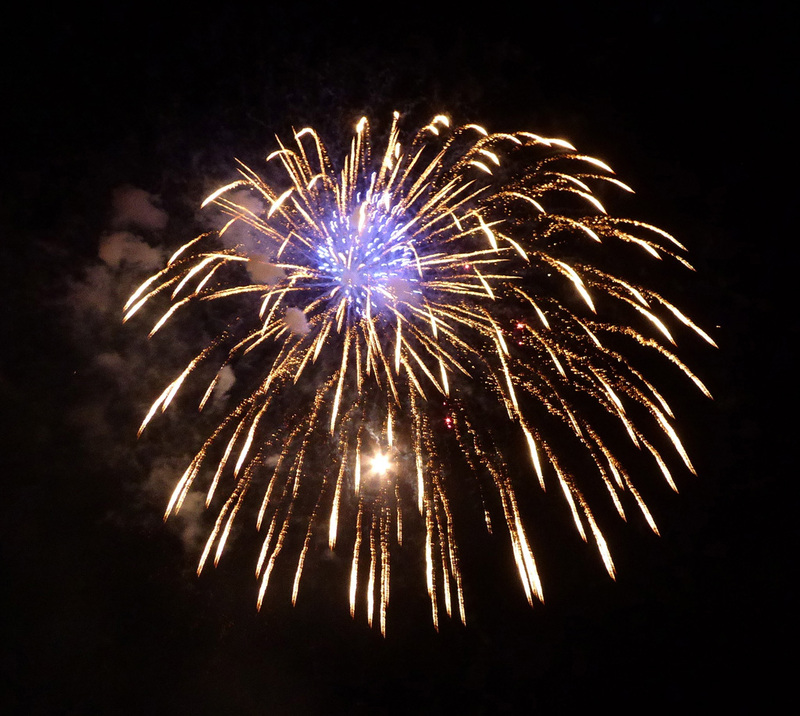 The fireworks were thought to be among the best display some of the OGHT team had seen. On Sunday after breakfast at the ‘Roddy Cafe’ a decision was made to explore Hokitika so we filled in the morning by exploring Sunset Point beach, Hokitika craft shops and galleries, and the Hokitika Gorge. We cut things fine for getting back to the Ross parade, but with some quick changes done by the team they were able to join in and be part of that celebration. The parade had moved along at a fast pace and when Rex checked around for any sign of Mike was concerned he was nowhere to be seen. Had he collapsed into a bush somewhere? A quick search found him gossiping with locals over a beer at the pub, so Rex did the civil thing and blobbed out with that group for a very pleasant hour. That evening saw us joining the locals in the Ross Community Hall for a cabaret and supper. Monday morning was the third beautiful day in a row for Ross – one passing goldminer said the drought had been so bad on the West Coast they had had to order in ferns and punga from a nursery in Christchurch! Yeah, right. And so we eventually packed our bags, paid our bills and headed our vehicle homewards. We had stops at Fox Glacier and Haast, then down to a riverbank where the whitebait sold for good prices – the Curly Tree facility had been recommended to us. Then it was back over the Haast Pass and into the Upper Clutha area – there to admire the majestic black clouds looming over the valleys. We certainly hadn’t seen anything like those during our visit to Ross! A great trip to the West Coast with great people – just the way these OGHT field trips always seem to work out. Pictures are by Rex and Sue.